The large open kitchen, is fully stocked with utensils, including microwave and coffee maker and ready for all of your cooking needs. The living area provides comfortable furniture, including a kitchen table that can seat up to six. Leather couch, loveseat and ottoman and flat screened television promises pure relaxation! The outdoor balcony has views of "The Pass" which is just a short walk away. The roomy master bedroom has one queen sized bed, one double bed, television, and ample closet and dresser drawer space with private access to the balcony. The large second guest room also contains one queen bed and one double bed, making this a perfect spot for family or groups. Linens, extra towels and pillows are stocked for your visit. Free dedicated high speed wireless is also included. One parking space is also provided with no visitor parking. As a SunHost guest, you will have access to office services, including fax, copy, and printing boarding passes. Seven day a week maintenance service is available as well as a 24 hour emergency on call person. This is a non smoking home. Of course, a top attraction is the premier location this condo offers. 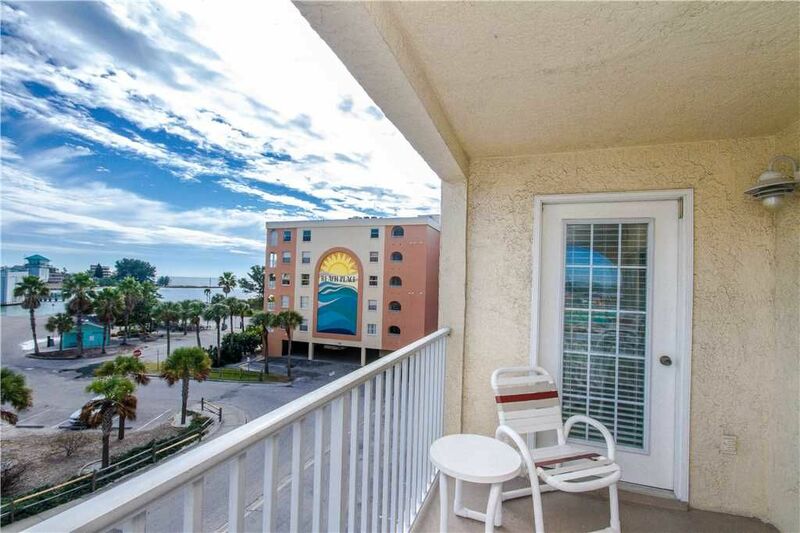 Near all amenities, including BBQ facilities, pool and of course, one of the most beautiful beaches in all of Florida - Madeira Beach. John's Pass Village is directly across the street. This number 1 tourist is a quaint turn-of-the-century fishing village. The Village has over one hundred unique shops, a variety of restaurants, the local fishing fleet, dolphin watching and shelling tours, boat rentals, parasailing and jet skiing. Best of all as a SunHost customer you can walk to this great entertainment destination. Anchor tenants include Bubba Gumps, Hooters and Hubbards Marina and also world famous Bamboo Beer Garden. We LOVE Beach Place... however this condo is the least stocked one. We have rented some with VRBO here. But we will rent directly from now on. This one doesn’t have simple things like salt, pepper, mixing bowls, a deck of cards, ink pens, little things can make a difference when trying to rent! Can’t beat the location and the office staff are great! !